Sam Atherton talks about podcasting with Awkward Pause, working in New York City's graphic design industry, and escaping it to experience life in Japan. Follow Jono on Twitter @jonohimself. Support the podcast at ATEBIT's Patreon. Download the outro music by FOLEY! here. 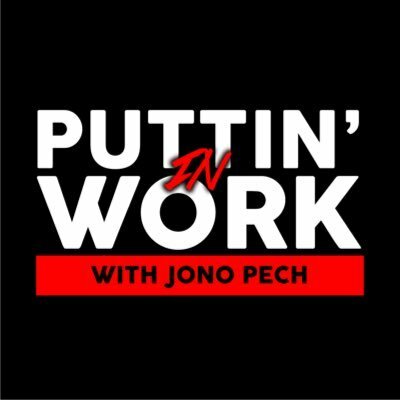 Find out more on the Puttin' In Work with Jono Pech website. Check out our podcasting host, Pinecast. Start your own podcast for free, no credit card required, forever. If you decide to upgrade, use coupon code r-f44d1d for 40% off for 4 months, and support Puttin' In Work with Jono Pech. Logan Wilkinson talks about his work at Irrational Passions and as the host of the Input podcast, as well as his journey to discover a love for writing, turning a weakness into a strength, and the motivational power of positive thinking. Ryan Hunter from comedy troupe POYKPAC talks about going viral in YouTube's early days, leveraging comedy videos into a career, the art of the pitch, and publishing an adult colouring book. Ronan Leonard talks about surviving the sinking of the MTS Oceanos, how the ordeal influenced his approach to business, and the lessons he now teaches to small business owners. Marc Straight talks about his experience shifting from performing in metal bands to working in musical composition and sound design in the video games industry, including dialogue editing in Divinity: Original Sin 2. Anthony Flarida talks about balancing parenting with creative hobbies of Twitch streaming and podcasting, plus his experience with Tourette's Syndrome and overcoming the usual social anxieties it creates. Ben Nicholas talks about working with Adidas on basketball shoes, with 343 studios on Halo 5, Creative Assembly on Halo Wars 2, the culture of Ubisoft, and how game developers deal with crunch and mental health pressures. Chris Ray Gun talks about making a career out of comedy on YouTube, finding an audience with political satire, and joining Colin Moriarty for Sacred Symbols: A PlayStation Podcast. Miss Ally Heart and Saleem the Dream talk about their experience as 2/3s of The Hungry Gamers, seeing the show become Australia's number 1 video games podcast in iTunes, growing the ATEBIT Collective, and joining Patreon to continue evolving the network's content. Jamie Apps talks about working his way into the journalism industry, launching his own entertainment publication, and writing for The Last Word to cover Australia's pro wrestling scene.